Obesity and metabolic syndrome are risk and prognostic factors for breast cancer (BC) and are associated with chronic inflammation. We investigated the association between distinct BC subtypes and markers of adiposity, dysmetabolisms, and inflammation. We analyzed 1779 patients with primary invasive BC treated at a single institution, for whom anthropometric and clinical-pathological data were archived. BC subtypes were classified by immunohistochemical staining of ER, PR, HER2, and Ki67, and their relations with the study markers were assessed by multinomial logistic regression. Adjusted odds ratios (ORs) and 95 % confidence intervals (CIs) were calculated taking luminal A as reference. All subtypes more aggressive than luminal A were significantly more frequent in younger (<45 years) than older women. 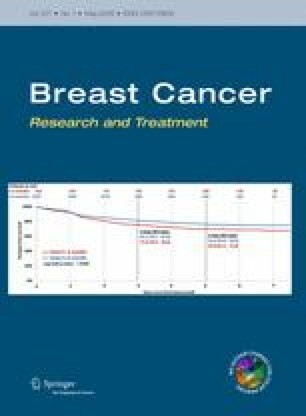 Before menopause, luminal B HER2-negative tumors were positively associated with large waist (OR 2.55, 95 % CI 1.53–4.24) and insulin resistance (OR 1.90, 95 % CI 1.05–3.41); luminal B HER2-positive tumors with large waist (OR 2.11, 95 % CI 1.03–4.35) and triple-negative tumors with overweight (OR 3.04, 95 % CI 1.43–6.43) and high C-reactive protein (p trend = 0.026). In postmenopausal women aged <65, luminal B HER2-negative (OR 1.94, 95 % CI 1.16–3.24) and luminal B HER2-positive tumors (OR 2.48, 95 % CI 1.16–5.27) were positively related with metabolic syndrome. Dysmetabolisms and inflammation may be related to different BC subtypes. Before menopause, triple-negative cancers were related to obesity and chronic inflammation, and aggressive luminal subtypes to abdominal adiposity. After menopause, in women aged <65 these latter subtypes were related to metabolic syndrome. Control of adiposity and dysmetabolism can reduce the risk of aggressive BC subtypes, improving the prognosis. The authors thank Judith Baggott for help with the English. Conception and design: R. Agresti, M. Sant, E. Meneghini, F. Berrino. Acquisition of data: H. Amash, A.Turco. Analysis and interpretation of data: E. Meneghini, M. Sant, R. Agresti, P. Minicozzi, F. Berrino, E. Tagliabue. Writing, review and/or revision of the manuscript: M. Sant, R. Agresti, E. Meneghini, P. Minicozzi, F. Berrino, E. Tagliabue. Administrative, technical, or material support: P. Baili, I. Cavallo, F. Funaro. Study supervision: M. Sant, R. Agresti, F. Berrino, E. Tagliabue. This study has been approved by the Ethical Committee of the National Cancer Institute.